Do you prefer OPI nail polisher over Shellac? OPI varnishes are unique lacquers that do not require UV-baking to finish, but their drying with a manicure or pedicure was not for impatient nature. However, this problem was solved by OPI with a new fast drying technology. We exchanged classic top couplings for the new RAPI DRY and added DRIP DRY drops to get your nails dry in jiffy. Step by step with OPI. Underlying lacquer for natural nails, significantly prolongs the durability of the lacquer, helps to adhere the colour lacquer and prevents the color of the nail bed. A variety of great colors. The composition of these colors will give you a long-lasting effect. ​Quick drying topcoat with maximum paint protection, no yellowing effect. Final drying after one minute with high gloss. 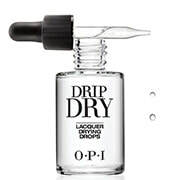 Best Dry Drops from OPI. Contains jojoba and vitamin E. Accelerates the drying of the varnish.